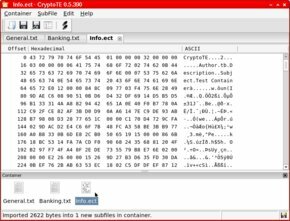 This page contains a few screenshots taken from CryptoTE 0.5.390 on four different operating systems. See the main page for downloads and more information. Each screenshot can be enlarged by clicking on the image. Operating Systems: Linux, Windows Vista, Windows XP and Windows 98. Screenshots from my Linux desktop. Someday I may make a screencast movie showing some of the basic editing operations. Everyday activity of editing a password file. This container shows two test password files created for these screenshots. Possibly _the_ most used feature of CryptoTE: the Quick-Find bar. Activated with Ctrl+F, it supports increment search in the current file. Another everyday activity: generating a new password and automatically inserting it into the file. With CryptoTE this can be done with two mouse clicks. 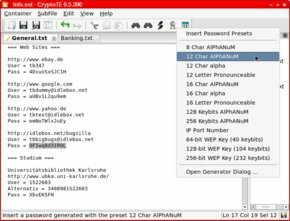 This is the flexible password generator built into CryptoTE. 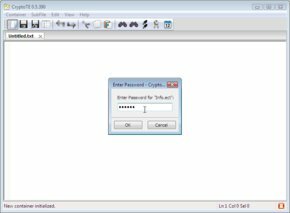 Special password presets can be created and saved. 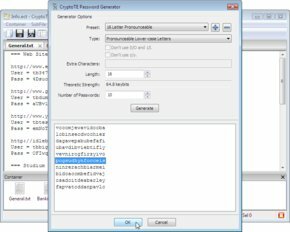 Many passwords can be generated at once and are enumerated when pasted into the text file. Auto-Close after a configurable time of inactivity. The container last opened can be quickly reloaded if needed. Binary files can be imported via drag-and-drop. 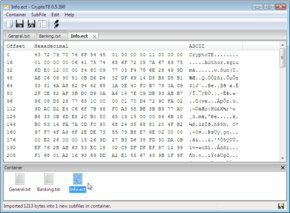 They are saved in the container along with usual text files, but are displayed as a hexdump. Multiple user password slots can be added and modified as needed. In this properties dialog many option like the compression algorithm and encryption cipher can be chosen for a subfile. Dialog box greeting the user and requesting password entry. It is shown each time the container is opened. 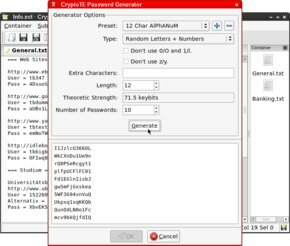 This is the flexible password generator built into CryptoTE. Special password presets can be created and saved. 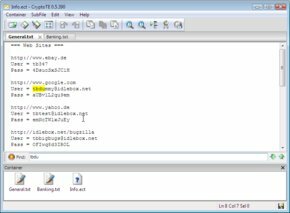 Many passwords can be generated at once and are enumerated when pasted into the text file. Two-click password generation is supported via the password-generator toolbar icon. Besides the properties for each individual subfile, the container properties too can be configured. Built-in HTML online help with a few instructions on how to learn good passwords. The options dialog in which you can select one of the three icon sets. 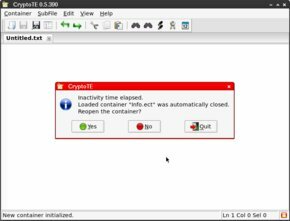 Another important aspect is locking of the container file: when opened CryptoTE holds an access lock on the file, thereby prohibiting access from other applications. Only three screenshots are shown here for sake of brevity. Refer to Windows Vista for more. However, these screenshots show CryptoTE translated into German! 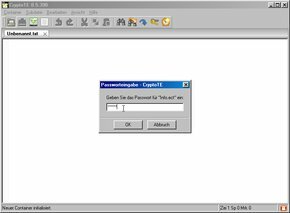 Dialog box to change the password of a user slot, this time in German. 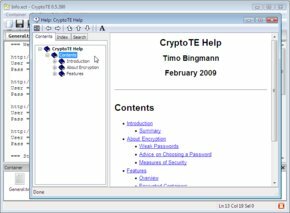 Proof that CryptoTE also runs on Windows 98, you have to use the "ANSI Build" version. Similar to Quick-Find there is also a Quick-Goto bar to jump to a line number. 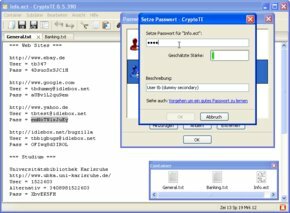 While typing a new password, CryptoTE will try to estimate its strength as indicated by the bar.